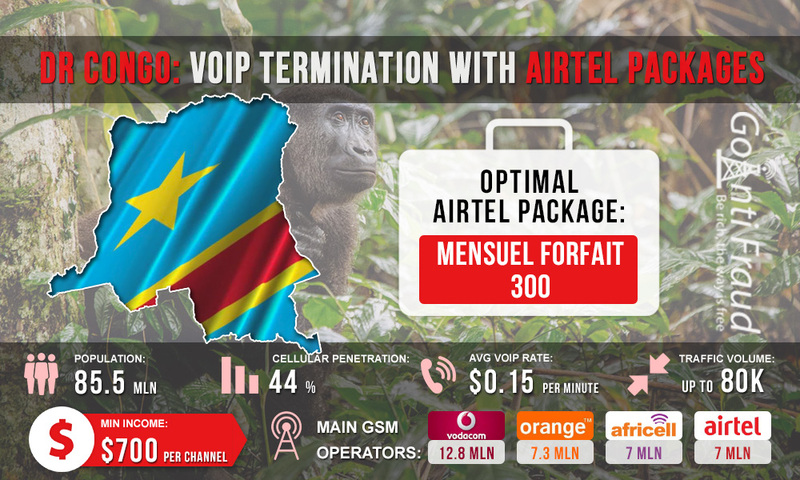 About 7 million local residents use Airtel's services in the Democratic Republic of the Congo. Considering the number of tourists and high level of emigration in the country, you can safely assume that generating of large flows of international traffic is definitely possible there. However, to make good money on termination of calls using the SIM-cards of this operator, it is important to choose the best tariff plan from Airtel. Nuit Forfait. Bonus with each topping up of your balance with 20 Units ($0.01 a day) and more. Hebdomadaire Forfait. Bonus of 70 minutes within the network; subscription fee - $ 0.32. Mensuel Forfaits. There are several options suitable for termination: 150 minutes within the network, subscription fee— $0.64; 100 minutes to all networks, subscription fee— $0.64, 300 minutes to all networks, subscription fee— $1.92; 525 minutes to all networks, subscription fee— $3.19. A reasonable choice for making money on termination will be the Mensuel Forfait 300 package. With this package, one minute of an outgoing call will cost only $0.006. If you manage to use all the minutes before the card is blocked by the operator, your income will constitute about $800 (from each GSM channel). In order for the gsm gateway business to make a steady profit, it is important to take care of protecting the SIM cards from blocking. To this effect, you need to effectively simulate a real subscriber's behavior in GSM networks. Use GoAntiFraud service to protect your SIM-cards, because in the countries with high rate, antifraud systems are especially active and the subscriber's numbers can get blocked already within a couple of hours after activation.